Day thirty-two was not the best day of my trip. It was cold and blustery. Sleet was falling and the news said snow was coming. Going outside to my car was like crossing the deck of a destroyer on winter picket duty in the North Atlantic. I was chilled to the bone and had developed a tooth ache. I was looking for a market to buy some soft food and tooth ache medicine. 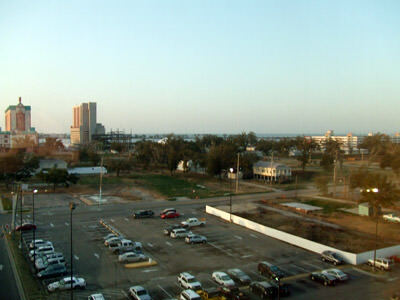 There are no markets close to the beach in Biloxi. In fact there are no buildings close to the beach. The hurricane took care of that. I enclosed a picture taken from my hotel this morning. Notice the missing houses and the repair being done at The Isle of Capri Casino. I am at the Palace Hotel a block away from and sixty dollars cheaper than the Capri. Rates go up dramatically on the weekend. I had to drive two miles inland to find a supermarket. I picked up supplies and scurried home. The only action I had was a little limit hold-em at the Capri. I won forty dollars. Chief Jack Hulls was in the game. He is an interesting man. He was a success as a Columbus, Ohio Firefighter and made a good living on his leave day as a real estate broker. My tooth was bothering me so I turned in early. Looking out of my window this morning, after a nights sleep, I have high hopes for day thirty-three. The sun is shining, my tooth ache is gone, and I am rearing to go. 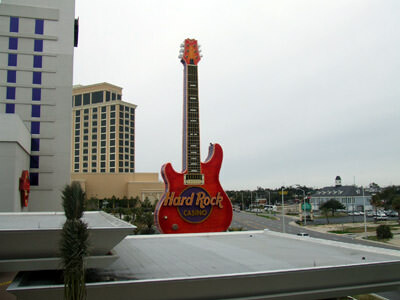 I will stay tonight and listen to music at the Hard Rock Casino. Tomorrow I am heading west.